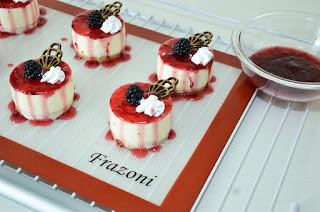 I love to cook but I have never used a silicone baking mat so when I saw Frazoni non-stick silicone baking mat I had to try it. If you are like me and never used one here what they do keep baked goods from stick to the sheet, cooks evenly and no breaking when you take it off the mat. It is 11-1/32 x 16-17/32 inches and weighs 3.8 ounces. It can make baking healthier as you do not use any spray or grease on the pan, can go in the oven, freezer and microwave safe. This is FDA approved material as well. My Opinion: This made baking cookies a breeze and I had no burnt edges and I like how evenly it cooks. The baking mat is also easy to clean up just wash and dry in your dish strainer or dishwasher safe and can be used up to 2000 times!